Due to construction near the East Riverfront MetroLink Station, Metro will not operate trains between the Emerson Park MetroLink Station and the Stadium MetroLink Station January 14-15. Customers will be transported by bus shuttles between those stations and should allow extra time for their commutes Saturday and Sunday. MetroLink will operate on a special schedule starting Friday evening in preparation of the weekend construction. Regular MetroLink service will resume at the start of service January 16. Blue Line Service will only operate from the Shrewsbury MetroLink Station to the Civic Center MetroLink Station. Blue Line customers should build an extra 10 minutes into their commutes to transfer to the Red Line. Red Line customers will not be affected. Red Line trains will begin operating at reduced speeds between the Arch-Laclede’s Landing MetroLink Station and 5th and Missouri MetroLink Station due to construction activity. Red Line and Blue Line customers should prepare for additional delays of 15 to 20 minutes through the end of service. Blue Line service will only operate between the Shrewsbury MetroLink Station and the Central West End MetroLink Station. Red Line service will only operate between Lambert Airport and the Stadium MetroLink Station and between the Emerson Park MetroLink Station and the Shiloh-Scott MetroLink Station. Customers will be transported by bus shuttles between the Emerson Park MetroLink Station and the Stadium MetroLink Station. Blue Line and Red Line passengers can expect 20-30 minute delays Saturday and Sunday. MetroLink will provide 10 minute service from the Central West End MetroLink Station to the Forest Park MetroLink Station. Metro will operate bus shuttles all weekend. Passengers should look for signs and/or Metro and St. Clair County Transit District personnel to direct them to the bus shuttles. The Express shuttle will transport MetroLink customers between the Stadium and Emerson Park stations with no stops. The local bus shuttles will pick up and drop off MetroLink customers at the Stadium station, 8th and Pine station, Convention Center station, Arch-Laclede’s Landing station, East Riverfront station, 5th and Missouri station, and the Emerson Park station. Eastbound Blues fans who take MetroLink home should look for the Illinois Express bus shuttles parked on Clark Street outside the Scottrade Center, facing west, Saturday night after the game. The Illinois Express shuttle will drop off passengers at the East Riverfront MetroLink Station, 5th and Missouri MetroLink Station and the Emerson Park MetroLink Station. 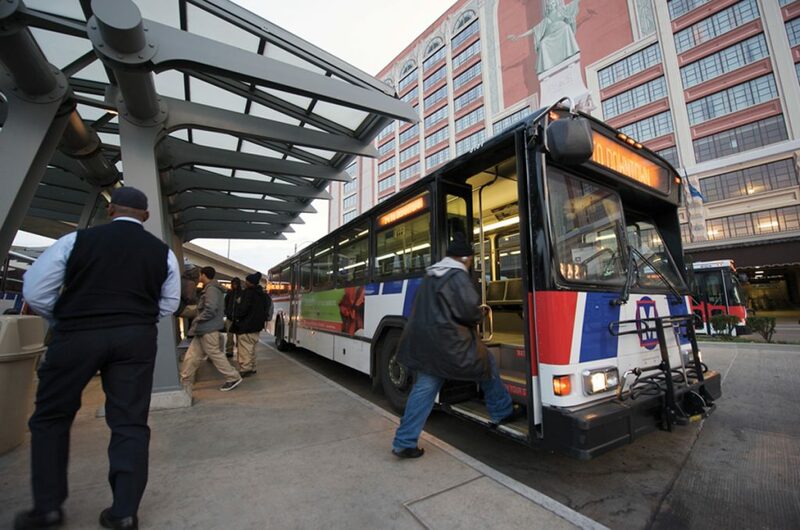 Eastbound fans who miss the special shuttles after the Blues game, can take MetroLink from the Civic Center station to the Stadium station and board the bus shuttles there to continue eastbound.